In this e-juice review, we’ll be covering all four flavors in the Holy Cannoli vape juice line! Each flavor in this e-liquid line offers a unique dessert vape experience, and two of them incorporate a Cannoli, which is not a flavoring we often see in e-juices. Each flavor in the Holy Cannoli line does have a VG/PG ratio of 70VG/30PG. This is a great blend for both sub ohm tanks and drippers, and will certainly provide satisfying flavor and vapor production. Each e-liquid is offered in a large 120ml Chubby Gorilla Bottle, which makes them very easy to carry with you when out and about. Unlike large glass bottles, these type of e-liquid bottles won’t crack or break open when dropped, which is always a good thing! What’s better is that each flavor is only $15.00, which is an excellent price for a 120ml bottle of ejuice! The nicotine strengths available are 0mg, 3mg and 6mg. Before getting any further, we’d like to thank ejuice.deals for sending us this e-liquid line for the purpose of this review. We will provide you with our overall thoughts about these flavors and let you know whether or not we recommend them! Remember, taste is subjective, so what we may like you may dislike and what you like we may dislike. We will first go over the specific mods and atomizers used to test each of these flavors and then continue on to the review of Holy Cannoli! Click Here to Check out Holy Cannoli E-Juice! Flavor Description: A wonderfully sweet strawberry cream cannoli, topped with confectioner’s sugar. This is a dream come true! This is a pretty sweet vape, so if you’re not a fan of sweet e-liquids, then you might not be a fan of this one. Thankfully, I’m a vaper who really enjoys sweet e-liquids, and I was expecting it to be sweet since it has in the description “topped with confectioner’s sugar”. On the inhale, you get a sweet ripe strawberry with hints of cream. On the exhale, you get the same sweet ripe strawberry mixed with cream and there are hints of bakery notes in the background. The bakery notes is the cannoli flavor mentioned in the flavor description, but it’s relatively light on the exhale. The strawberry flavor tastes pretty much like if you just bit into an actual sweet strawberry, which compliments the entire vape. The cream is much more noticeable on the exhale, and definitely helps round out the exhale. However, the sweet strawberry is the most dominant flavor, which isn’t a bad thing. The vapor production is solid, and the throat hit is silky smooth. Overall, Holy Cannoli Strawberry Cream is a great strawberries and cream vape that adds the cannoli element to add a nice twist. If you’re a fan of strawberry and cream vape juices, then definitely give this one a shot, especially when considering its price! Flavor Description: The original Frencholi is back!!! The French Toast from Holy Cannoli is now the same recipe as the original Holy Frencholi due to popular demand. This is a really good french toast flavor that’s pretty spot on to the what it’s going for, which is a french toast with syrup and butter. With that being said, on the inhale you get a french toast with faint hints of maple syrup. However, on the exhale is where this e-juice truly shines and comes together to bring you a wonderful breakfast vape. You first get the french toast flavor with maple syrup, and at the end of the exhale, you’re tasting hints of cinnamon and butter. There’s also a slight sweetness, which can easily pass as powdered sugar. The two most dominant flavors in this e-liquid are the french toast and maple syrup. The maple syrup is done quite well, and is not overpowering like some other e-liquids that has this flavoring. The cinnamon notes can be picked up in the background of the exhale alongside the butter. The slight sweetness mentioned at the end of the exhale really makes you come back for another vape. The vapor production is great and the throat hit is smooth. All in all, Holy Cannoli French Toast is a home run and easily an all day vape for us at Vaping Cheap! If you’re a fan of breakfast flavors and looking for a well balanced french toast flavor, then we definitely recommend this one, you won’t be disappointed! 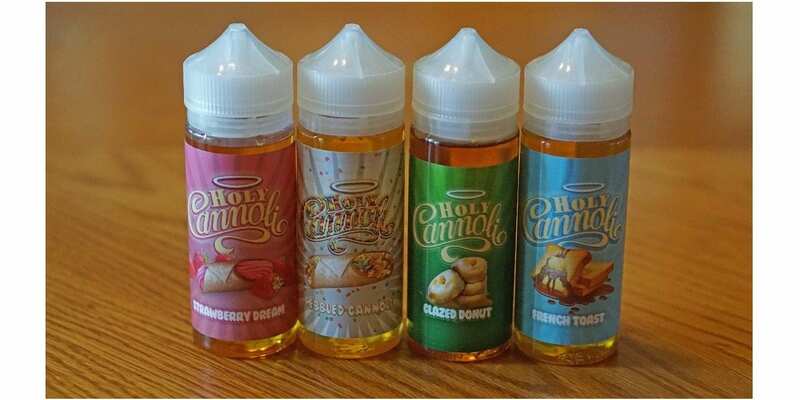 Flavor Description: Holy Cannoli E-Liquid has just launched their latest creation…Glazed Donut. This flavor is full of creams, full of custards and is the perfect glazed donut. Morning, Noon, or Night, you will never want to put this 120 mL bottle of goodness down. Donut flavors have become very popular, especially this year and we’ve seen many donut based flavors be released. This is Holy Cannoli’s latest flavor, and this donut flavor is a bit different than the rest since it has a mixture of creams and custards alongside the donut. On the inhale, you get a glazed donut flavor. On the exhale, you get the same glazed donut flavor with hints of cinnamon and custard. The custard is most noticeable towards the end of the exhale, and the cinnamon flavor can be tasted in the background as you exhale. There is a creaminess surrounding the exhale as well, which gives it a nice touch, and makes the “glaze” taste more authentic. I do think with some more added steep time, the custard will become more noticeable. The throat hit is smooth, and the vapor production is as you’d expect with a 70VG/30PG blend. Overall, Holy Cannoli Glazed Donut is a solid donut flavored e-liquid. I do like the addition of creams and custards, as it does help round out the donut flavor and gives more authenticity to the glaze. If you’re looking for a good donut flavor that’s affordable, then we do recommend giving this flavor a shot. Flavor Description: Holy Cannoli E-Liquid is on fire! Pebbled Cannoli is a creamy, and delicious fruity pebble treat wrapped in a cannoli of everlasting flavor. This treat has definitely earned it’s title of being Holy. Grab a bottle today! This is an excellent fruit cereal vape with a slight twist at the end. We’ve seen tons of cereal vapes hit the market, and while many are good, there are a lot that do taste relatively the same. On the inhale, you get a fruit cereal flavor. On the exhale, you get the same fruit cereal flavor, except this time around it’s creamy, and on the end of the exhale, you’re met with the bakery note. The bakery note is the cannoli flavor, and I do wish it was a bit more noticeable. The creaminess of the exhale really adds to the overall vape experience, and does make it much more tasty in my opinion. The pebble fruit cereal is also well done with no overpowering lemon, which is definitely a good thing. The throat hit on this e-liquid is silky smooth and the vapor production is certainly satisfying. All in all, Holy Cannoli Pebbled Cannoli is an excellent cereal vape. Even though it’s pretty straightforward, it’s still a tasty vape that we can easily consider an all day vape. If you’re a fan of pebbles fruit cereal flavor, then we highly recommend picking p a bottle of Pebbled Cannoli! In conclusion, the Holy Cannoli e-juice line offers four fantastic flavors at an affordable price. Our favorites were definitely the French Toast and Pebbled Cannoli, both of these we can vape all day without getting tired of them! In addition, all four of these flavors vaped great in RTAs, RDAs and sub ohm tanks. We’re sure vapers who are fan of dessert or breakfast flavored e-liquids will certainly enjoy any of these flavors. Each of them offer a different vape experience, and two of them implement the cannoli flavoring. The throat hit on all of them were smooth, so we’re sure the nicotine they’re using is of good quality. The vapor production is also great, and is pretty much what you would expect with a 70VG/30PG blend. No matter if you’re dripping or filling a tank, it’s made easy since these flavors do come in large Chubby Gorilla bottles. At under $15 for a 120ml bottle, we can easily recommend any one of these flavors! So, if you’re in the market for good quality e-juice at an affordable price, then definitely check out the Holy Cannoli line!